Take on your tough jobs with the DW089LG 12V Green Cross Line Laser. It has a 12V Li-Ion rechargeable power tool battery platform and green beam laser technology. It is resistant to water and debris, thanks to the over-moulded housing and IP65. Kit includes Blow Mould Case, Extended Ceiling Bracket, 12V Battery, Charger and Green 3 x 360 Line Laser. The DW088LR 12V MAX Red Cross Line Laser is compatible with the DEWALT 12V Li-Ion rechargeable power tool battery platform. This laser features self-levelling cross lines and a full-time pulse mode. Designed with Over-moulded housing and IP65 water and debris resistance. The DW074KD Self-Leveling Int/Ext Rotary Laser Kit provides horizontal self-leveling for quick and easy set-up. Protected rotary head and weatherproof design deliver interior and exterior job-site durability. This kid includes: DW0742 Digital laser detector, Contractor bag, DW070 Wall mount, Target card, and (2) D size Alkaline batteries. 6-Inch. 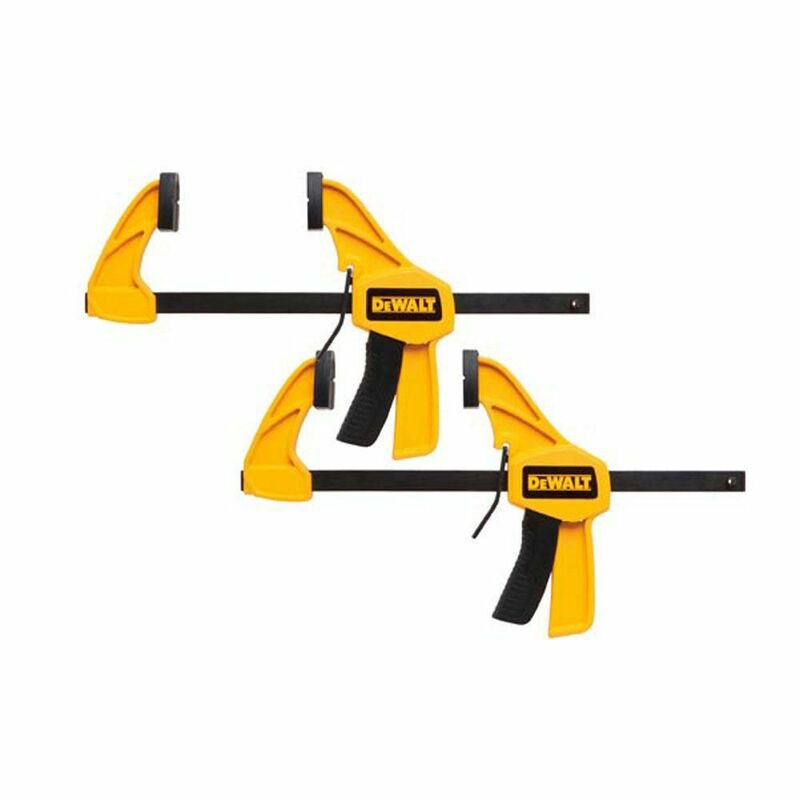 Medium Trigger Clamp (2-Pack) The DEWALT 6-in medium bar clamps are versatile and easy to use. There reinforced nylon bodies and heat treated steel bars are strong and durable. With 100-pounds of clamping force, 2-7/16-in throat depth, and removable jaw pads to help reduce marring, these clamps are Guaranteed Tough. Comes in a pack of 2. 6-Inch. Medium Trigger Clamp (2-Pack) is rated 4.9 out of 5 by 7. Rated 5 out of 5 by Bubbly from Very pleased with this product. Works well. Very pleased with this product. Works well. Rated 5 out of 5 by Eric from Its a great little clamp, made to last and easy... Its a great little clamp, made to last and easy to use. It could have a better trigger gear ratio allowing slight adjustment to pressure applied. Sometimes you just don't need full force. Rated 4 out of 5 by Anonymous from Trigger clamp I can clearly see a big difference in quality beween dwalt trigger clamps and harbor freight trigger clamps. Dwalt is far more superior, handles and grips much stronger without loosening. Rated 5 out of 5 by Susan from DeWalt trigger clamps Use of the clamps are very easy. The quality is great. Does the job I intended it to do. This product was recommended by my son as easy to use.